No coupon needed! Discount automatically applied at the pharmacy. With our new Avion Prescription eVoucherRx™ Savings Program, patients pay no more than $20 per prescription. Avion takes the hassle out of getting your discount by no longer requiring a coupon! 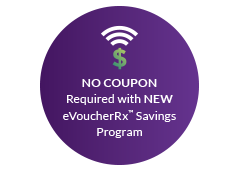 The new eVoucherRx™ is a paperless electronic program that makes co-pay savings on your prescription easy. Simply take your eligible prescription to a participating pharmacy (~90% of retail pharmacies) and the discount will be automatically applied to your co-pay. For all pharmacies not able to participate in the Avion eVoucherRx™ program we offer a universal ID that will allow the patient to enjoy instant savings. Please present the IDS below for your PrimaCare™ prescription and the savings will be automatically applied.